Lace up your shoes. Grab a bottle of water. Pick up a friend. And head on over to Bond Brothers for the Bond Brothers 5K! Race packet pick-up will be Thursday, September 14 and Friday, September 15 at Bond Brothers Beer Company from 4-8PM. Pick-up will also be available event day at 9AM at Bond Brothers. The Bond Brothers 5k will support the CAPTRUST CAPCommunity Foundation, supporting children in need across our communities. Each step you take is one step closer to a child who receives support, mentorship, and the essentials for the skills and development to thrive!Now lace up with your neon yellow shoelaces. And come on out! Check out the race route here! The Bond Brothers 5K Needs You! Believe it or not, the Bond Brothers 5K is right around the corner. Register at Discounted Rates Now through August 16! This isn’t just a local community race, it’s a local community race that raises funds for children in need. Funds will be used to support the CAPCommunity Charity of Choice, Read and Feed among many other local community charities that provide much needed support for children. Gather a few family members, colleagues, and neighbors and run in the race! Every step you take supports a child, whether it is providing educational services, mentorship, activities that provide social and developmental skills, medical care, and other essentials for a child to grow. Come on out, let’s have fun on the run. Register for the race at https://www.bondbrothers5k.com/register/. And stick around for the after party! Whether it is handing out packets to runners or guiding runners on the route, the Bond Brothers 5K run needs local and community support. It takes a lot of hands to organize a community run, and we need you! See what volunteer opportunities there are for you! Help us spread the word. Send out a social media post, hand out fliers, or post on neighborhood community boards. We need the word for this event to go far and wide! Donate a children's book and support children in reading and development. CAPTRUST will be collecting new or gently used books from July 28th through August 4th. Drop books off in a donation box in the Exchange. Please read the specific book donation guidelines. While it still feels like the middle of the summer, the beginning of school is just around the corner. 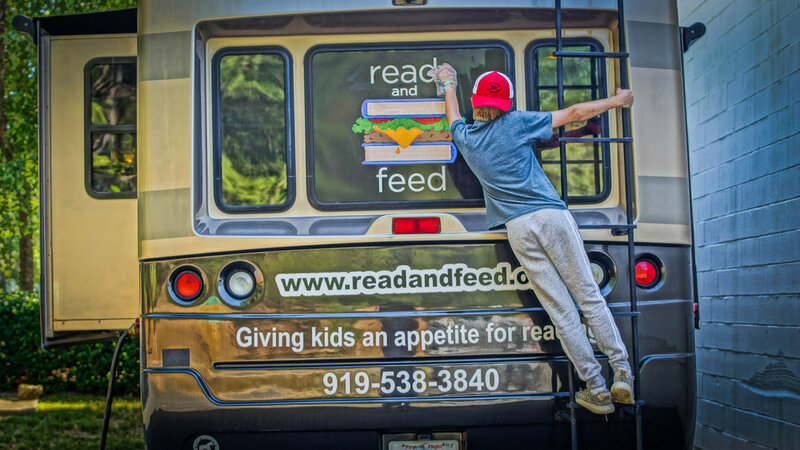 Read and Feed supports children in Wake County with reading skills while providing an evening meal. Children who build reading skills also increase confidence, social skills, and early childhood development. And don't miss the next Pancake Breakfast Friday, August 4th, 7:45am- 9am in the Exchange! Delicious bacon, pancakes, coffee, and orange juice for $5, all supporting Read and Feed! Did you know that more than 636,920 people struggle to access nutritious and adequate amounts of food necessary for a healthy life? Even in Wake County, there are food deserts, where children and adults do not have access to nutritious fruits and vegetables? CAPCommunity Foundation Family Day at the NC Food Bank brought families together to sort and pack meals to families who would not otherwise have healthy food. CAPCommunity Foundation Volunteer Coordinator Trae Cole comments, "Kids got to learn about what the food bank did, how the food is distributed to eastern NC, and how important it is for healthy food to be donated from farms. 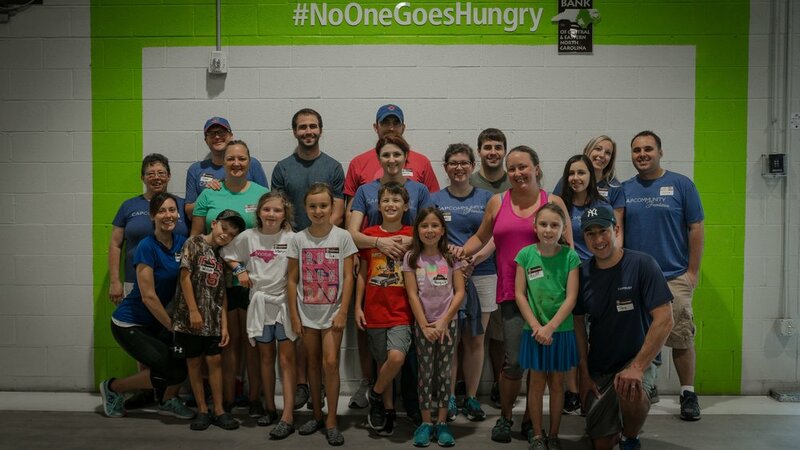 It was a bit messy, but in the end we packed over 5,000 meals worth of food this past Saturday." Obtain and distribute between 63-64 million pounds of vital food and non-food essentials in our 34 county service area to over 800 emergency and non-emergency non-profits. Ensure compliance of Feeding America regulatory audit. Fight hunger and promote healthy eating habits by increasing our focus on nutrition. Raise $9.6 million dollars in annual revenue which will enable us to maintain and expand our services. For more information on the NC Food Bank, visit http://www.foodbankcenc.org. Check out these fun pictures below!! CAPTRUST was represented at the Tammy Lynn Center on June 17th Rock and Ride by three riders (Shira, Freddy, and Vivian) who rode 4 hours and 37 miles in total. Vivian comments, "We had fun!" Rock 'n Ride Raleigh is a 12-hour cycling event with food, live music and more. For details on the event, visit RocknRideRaleigh.org. Volunteer Highlight: Vivian Houchens made 32 bibs and a Kenya flag banner for the Mercy House, a mission in Kenya. Her church (New Hope Church) partners with Mercy House has several campuses, two of which are in Kenya. A team from her church is currently in Kenya. Pictures: Pastor Brian Wilson. Mark your calendars for Saturday, September 16th for the 1st Bond Brothers 5K supporting CAPCommunity Foundation. This year, every runner and team participating in the Bond Brothers 5k will have the opportunity to raise money for CAPCommunity Foundation! And what's better than having fun while helping a cause we can all get behind? After the race, Bond Brothers will be hosting a block party. Music, food trucks, and plenty of beer! All are welcome. You do not have to run to come and join the fun. Although, who doesn't want to run for a good cause? What can you do to help Bond Brothers and CAPCommunity Foundation? Do you know of a community leader who would be willing to sponsor the event? Become a Bond Brothers 5K https://www.bondbrothers5k.com/sponsor-1. Check out all of the race details here: https://www.bondbrothers5k.com/race-details/. Pass on the word! Include a link to https://www.bondbrothers5k.com/ on your social media platforms. CAPCommunity Foundation helps kids all over the nation. As a volunteer-run organization, it finds and vets requests to support grants that help children with physical disabilities, illnesses, abuse, poverty, absence of a parent, and more. Every step you take, running, or walking will support children in our communities who need support in their lives. Recently named the #1 New Brewery in the US by USA Today! Certified Cicerone Brewmaster Whit Baker and crew have developed a vast array of proven recipes to satisfy all craft beer lovers. Whether you enjoy Stouts, IPAs, Saisons or Sours, Bond Brothers beer offerings are sure to please. Bond Brothers decided to make historic downtown Cary their home. They chose downtown Cary based largely on the revitalization movement taking place there. Their recently completed industrial modern space is quickly becoming a popular epicenter in the downtown community. With over 9000 square feet of brewery, taproom and beer garden to enjoy, they have built a destination that matches the quality of their beers. There are 14 unique beers on tap, a robust barrel sour program, monthly guided brewery tours, and a kid/dog friendly environment. Bond Brothers Beer Company has created a must see destination in the heart of the Triangle! Spring is the perfect time of year to kick off giving back to others in the community. Digging in the dirt is a fun way to start out a Saturday morning! Community gardens educate children on how to grow and eat healthy food, the importance of the environment, in addition to benefiting the local community by offering fresh fruits and vegetables in areas that may be considered a food desert. With so many local fun runs and walks supporting an array of needs happening nearly every weekend in the spring and summer, find something that you can get behind and join in the fun. Many events are family or pet-friendly for all types of athletic abilities. It’s the season for outside sports. Many after-school and community programs needs coaches. Sports is a great way to bond with a child, can enhance self-confidence, and build team work skills. Pick up a ball! Whether it’s a car wash, candy/cookie sale, or community yard sale, organizing an event can raise funds for many worthy causes. If you know of a member in your community who lives alone or needs extra assistance, this is a great time to stop by, offer to take them out for an afternoon, mow their lawn, or enjoy dinner out on the porch. These are only a few activities you can do in the springtime to get to know others in your community, benefits children and adults in need, and just makes you feel good on a bright sunny day! Recently, CAPCommunity volunteers stopped by Read and Feed to sort through books. Helping children read begins with a great book. Read and Reed receives donated books year round, and they need help to make sure there are no dog ears, torn pages, and are cool for school reading. There are many ways to help a child read, and it starts with a great book! Who were your mentors when you were young? Youth need leadership and life skills. Organizations like HOBY are bringing motivation to youth across the country. Nearly 10,000 students participate in HOBY programs including: Community Leadership Workshop, State Leadership Seminar, World Leadership Congress, Advanced Leadership Academy, and International Tours Program. Their vision is to, "motivate and empower individuals to make a positive difference within our global society, through understanding and action, based on effective and compassionate leadership." CAPCommunity Foundation supports HOBY through the small grants program. Congratulations to the Tammy Lynn Center for Developmental Disabilities who was awarded a small grant presented by the CAPCommunity Foundation team members in March 2017. They were also a finalist for the 2017 Charity of Choice. Founded in 1969, Tammy Lynn Center for Developmental Disabilities empowers families and enriches the lives of children and adults through education, community and support services. They provide early intervention, education services, respite care, residential services, and therapy services. In 2016, CAPCommunity Foundation volunteers painted ceiling tiles for several classrooms and continues to support Tammy Lynn Center for Developmental Disabilities in a number of ways. The CAPCommunity Foundation is excited to announce the 2017 Charity of Choice: Read and Feed. When children can’t read, they sit at their desks disengaged with classwork and have a low self-esteem, which impacts their social and scholastic development. If a child can’t read, they may become embarrassed easily and act out in anger or defiance. The numbers are staggering: seventy-four percent of children who are not reading on grade level at the end of third grade will never catch up to graduate with their class. The domino effect impacts the entire community: high school failure costs taxpayers between $320 and $350 billion a year in lost wages, taxable income, health care, welfare and incarceration costs, among others. Check out this article by Jim Goodnight focusing on the need for reading programs in North Carolina. Read and Feed is changing this paradigm, one book at a time. Their concept is to combine a mobile classroom, a child friendly atmosphere, books, a warm meal, and volunteers who tutor children. 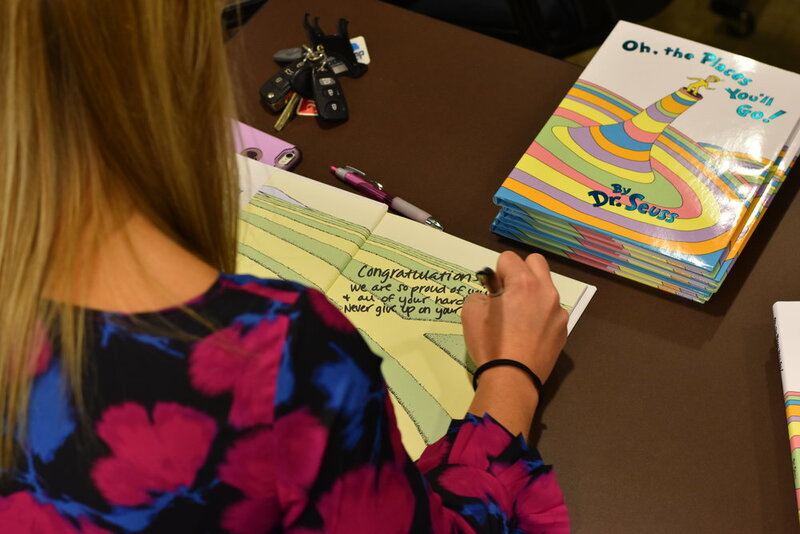 “We work with at-risk, low-income children who are identified through our partner schools,” explained Kati Mullan, Read and Feed’s executive director. Many children are more than one reading level behind their peers. Offering an afterschool literacy program in a fleet of three mobile locations, many volunteers support children not only by reading, but through mentorship, as they catch up or maintain their reading level. Read and Feed’s impact: an 88% increase in improved reading attitude or confidence. The CAPCommunity Foundation is excited to be partnering with Read and Feed throughout the year. We will be hosting volunteer opportunities, ways to increase much-needed funding, and feature a community event this fall.